When the super olympic games rocks into town, you've got to put your game face on and power up with vitamins and minerals. This goodness can only be found in super foods. Super foods do wonders for your mind, body and soul. The good thing about superfood is you can easily find them in the market place or easily pick them in your backyards. Here's a quick list of foods you should include in your diet. These foods are considered by experts and by many people as superfoods, and has already been proven to be beneficial. So guys why don't we start buying and cooking with superfoods ( list above ) and give our family and loved ones a healthy and super power life ? and don't be disapointed, there is dark chocolate for die hard chocolate fans :-),so share your innovative and delicious recipes with us here on JCO. 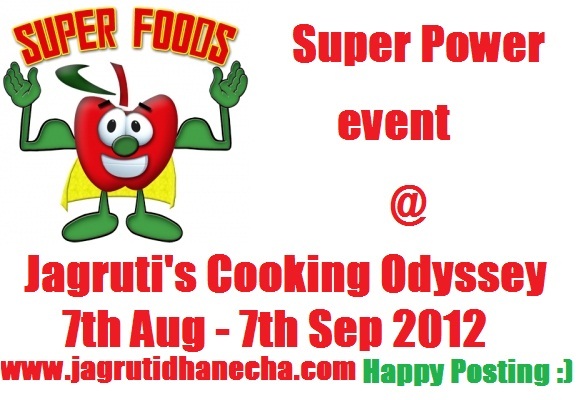 I have given a list of super food above, but if you find any more you can prepare dish from them too. Use of logo is not compulsory, but usage is encouraged as it helps to spread the word. Dated entries will be accepted if they are re-posted and linked back to this event. It's Compulsory . If they are not re-posted or linked, will be deleted. If you are linking archived recipes, please leave a comment for me . You can send entries to our email if linky doesn't work jagrutiscookingodyssey1971@gmail.com with the following details. Go ahead and send your super power recipes. Thank you linking your entries @ JCO..!! I have submitted my entries. Hope all are suitable for the event. You organise so many events. I will SEND as much as entries possible, hope one day you will be tempted to give me any award hahahah.